Instrument Adjustment | Thomas Tumbarello | D.C. There are millions of nerves that travel throughout the human frame controlling the function and physiology of the body. The human frame has hundreds of joints that have the potential to be misaligned. As a result, the body can falter and joints begin to degenerate. 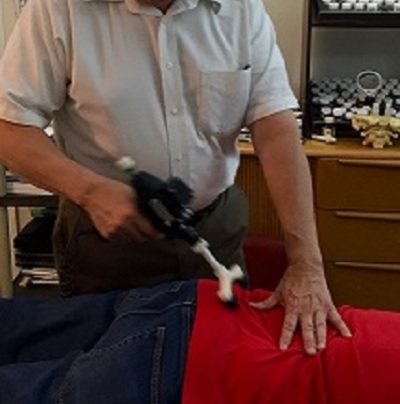 Leveraging spring held or electronic instruments allow a practitioner to deliver rapid and light specific forces at the precise vector to establish appropriate joint alignment. All instruments in use at this office are FDA approved, safe and painless. It helps us get the job done without excessive force or strain. It’s also great for post-surgical, delicate, elderly and child care (even cats and dogs like it too! ).